INFINITELY VARIABLE FRONT WHEELS - Height adjustment at the front wheels is infinitely variable. Since the height of each front wheel has to be separately adjusted, you are also sure that the blade shaft has the correct depth adjustment across the entire operating width. REAR WHEELS DEPTH ADJUSTMENT - The rear wheels can be set to a number of different fixed positions. As a result of the dual adjustment capabilities, you can use the blades until they are completely worn. RUBBER DEFLECTOR - Even when you work without using a collection bag, the large volume of raked moss must quickly come from underneath the frame without exposing the operator to anything that is thrown up by the blades. The well-sized rubber deflector will catch all of the dust and sand that is thrown up. VERTICAL BELT TENSION - Problem-free operation was the point of departure for developing the vertical belt tension. Thanks to this system, the belt retains its natural shape even when it is operating. This virtually eliminates wear on the belt, thus significantly extending its operating life. ALUMINIUM WHEELS - Work comfort means that you perform the work with a minimum of effort. In this respect, ELIET pamper the operator of the E501 PRO. Large wheels with light aluminium rims running on tyres with a supple natural rubber tread ensure that this machine glides across the lawn. Each wheel is equipped with two large-size ball bearings. These heavy duty wheels are able to withstand the dusty conditions in which these machines have to operate. The wide wheel tread minimizes the risk of wheel rut formation on wet lawns. WHEELS WITH MUD SCRAPERS - If dethatching takes place in the spring on a swampy lawn, the newly raked moss tends to stick to the wheels so that the machines move up and down when crossing the lawn, with this having a clearly visible effect on the result of the raking. 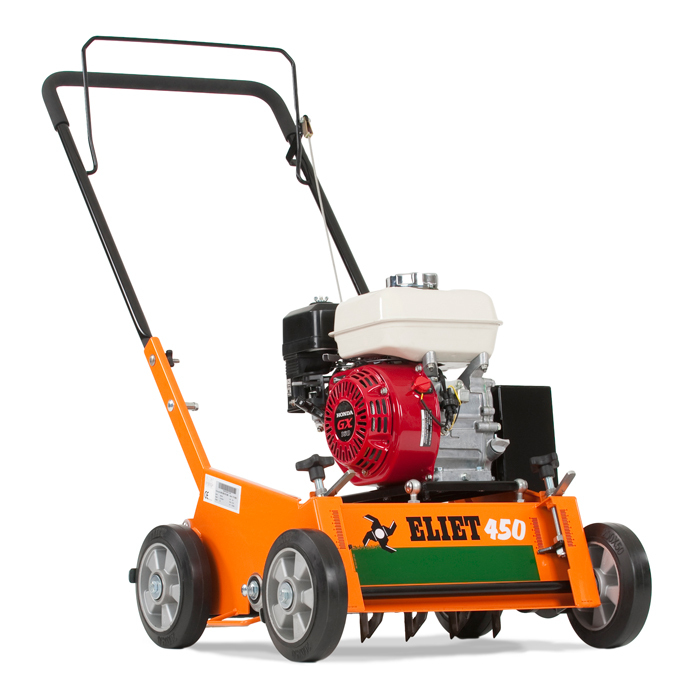 To remedy, ELIET have fitted scrapers to the wheels of its professional dethatching machines. Any dirt that sticks to the wheels is immediately removed from the wheels.